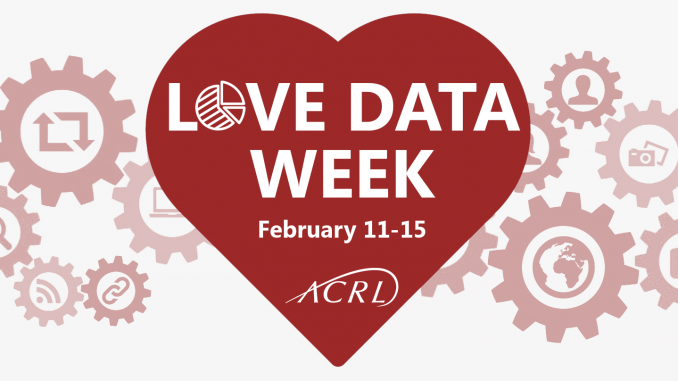 This week (February 11-15, 2019) marks the fourth year of Love Data Week (LDW). According to its website, LDW is a social media event coordinated by research data specialists, mostly working in academic and research libraries or data archives or centers, designed to raise awareness and build a community to engage on topics related to research data management, sharing, preservation, reuse, and library-based research data services. The event is open to any institution—small, large, research intensive or not—to share practical tips, resources, and stories to help researchers at any stage in their career use good data practices. 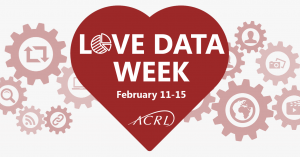 This year’s theme is “data in everyday life,” and ACRL has several resources available to help you grow your love of data and your professional skillset. Local in-person training. Bring the ACRL RoadShow “Building Your Research Data Management Toolkit: Integrating RDM into Your Liaison Work” to your campus, chapter, or consortium. Led by two expert presenters, this one-day workshop assists liaisons in identifying their existing skills and mindsets that transfer to research data management services and then creating a learning plan for the RDM-specific knowledge needed to serve their subject disciplines. Books and journals. Explore the open access Curating Research Data two-volume set, Practical Strategies for Your Digital Repository and A Handbook of Current Practice; check out Databrarianship: The Academic Data Librarian in Theory and Practice; and read College & Research Libraries, C&RL News, RBM: A Journal of Rare Books, Manuscripts, and Cultural Heritage, and Keeping Up With… for the latest research and innovative practices. Online learning. The Scholarly Communication Toolkit, developed and maintained by the ACRL Research and Scholarly Environment Committee (ReSEC), has a subsection dedicated to research data management that collects information and resources to help you engage in the challenges of research data stewardship, curation, and management. Volunteer opportunities. Volunteer to serve on an ACRL committee by February 15 and share your data expertise and talent with the profession. For more information, visit the ACRL website or contact ACRL Content Strategist Erin Nevius at enevius@ala.org.